In the hectic world of today, speed plays a key role. That’s why the conservative technologies get out of date hopelessly. They are appeared to be replaced by innovative methods based on blockchain technologies. This is exactly the case when it comes to property renting. The necessity to waste a lot of time on personal meeting with the landlord, if only to get the keys and sign the contract, makes life difficult. But there is a solution! 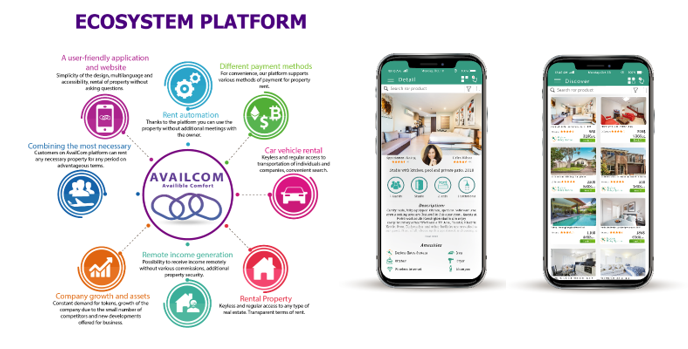 AvailCom team created an ideal service that allows you to rent both movable and immovable property. For the tenants and landlords. Imagine the opposite situation. People own a movable or an immovable property, they want to make money out of it, but of course, they are anxious about keeping it safe. AvailCom team takes care of the tenants and the landlords both. The leasers will get the keyless access to the property just in a few clicks. No more personal meetings! Those who turn in property also shouldn’t worry. We offer you lots of devices that you can get acquainted with on the platform’s website. They include sensors, cameras, the automatic device that does not require a change of regular lock. The security system is considered down to the last detail: the customizable smart contracts and decentralized storage of data will not allow anyone to manipulate ratings and feedback. Availcom is a team of highly skilled specialists who set the clear goals. Our developments are not the fantastic fiction, they are absolutely real and can bring success and large profit to our investors, especially at the stage of a closed sale. Rules and restrictions that serve to protect the participants’ equity are represented on our official website as well as terms favorable to everybody. The public offering of tokens according to the DAICO concept allows clients to be fully assured in the safety of our project. Each participant can influence its development strategy! Currently, the team has worked through technical documentation and marketing analytics. The prototype of the device for keyless entry to the accommodation is already developed. The MVP of the mobile application is also created, as well as the smart-contract. Many top-rated agencies have already appreciated our project!